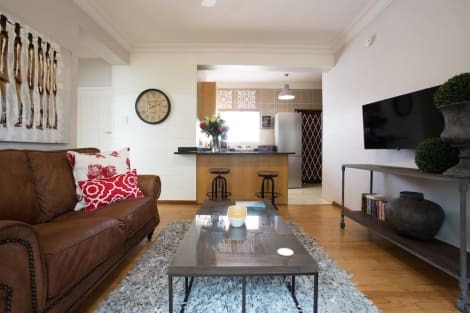 With a stay at this apartment, you'll be centrally located in Stellenbosch, a 4-minute drive from Stellenbosch University and 12 minutes from Spier Wine Estate. This apartment is 0.3 mi (0.5 km) from The Stellenbosch Village Museum and 0.3 mi (0.5 km) from Fick House. This hotel is located about 4 km from South Africa's second oldest town, Stellenbosch, and is a mere 25 minutes' drive from Cape Town's International Airport. This spacious, modern hotel comprises a total of 37 rooms, including 3 generous suites, and opened in May 2008. Guests enjoy luxury accommodation, fine wine tastings and superb service. The luxury rooms and suites are spread between 3 buildings across the estate, with each building designed in such a way as to maximise the views over Stellenbosch and the surrounding vineyards and mountains. Facilities on offer to guests at this air-conditioned establishment include a lobby area with a 24-hour reception and check-out service, a hotel safe and a currency exchange facility. Guests can enjoy gourmet and casual dining in either of the 2 hotel restaurants and there is a bar. Business travellers will appreciate the conference facilities and WLAN Internet access (charges apply) and guests can also take advantage of the laundry service and 24-hour room service (charges apply). There is parking available for those arriving by car and it is possible to hire bicycles on the premises. All facilities have spectacular views, with their tranquil waterside setting, backed by the grandeur of the Stellenbosch- and Helderberg mountains and vineyards, providing an idyllic backdrop. All rooms come with a private bathroom with a bathtub and a hairdryer and offer a king-size bed. They are equipped with a direct dial telephone, satellite/ cable TV, Internet access, a safe and a minibar. Furthermore, tea and coffee making facilities and individually regulated air conditioning and heating are provided in all accommodation as standard and all units feature either a balcony or a terrace. Make yourself at home in one of the air-conditioned rooms featuring kitchenettes with refrigerators and ovens. Rooms have private balconies. Complimentary wireless Internet access keeps you connected, and satellite programming is available for your entertainment. Conveniences include safes and microwaves. With a stay at 401 Rozendal Cottages in Stellenbosch, you'll be within a 10-minute drive of Spier Wine Estate and Skilpadvlei Winery. This romantic cottage is 7.1 mi (11.4 km) from Stellenbosch University and 1.8 mi (3 km) from Polkadraai Farm. With a stay at this apartment, you'll be centrally located in Stellenbosch, a 4-minute drive from Stellenbosch University and 10 minutes from Spier Wine Estate. This 4-star apartment is 0.1 mi (0.1 km) from Dorp Street and 0.1 mi (0.1 km) from Toy & Miniature Museum. Treat yourself with massages, body treatments, and facials. You're sure to appreciate the recreational amenities, which include 2 outdoor swimming pools and an attached winery. Additional features at this bed & breakfast include complimentary wireless Internet access and wedding services. lastminute.com has a fantastic range of hotels in Stellenbosch, with everything from cheap hotels to luxurious five star accommodation available. We like to live up to our last minute name so remember you can book any one of our excellent Stellenbosch hotels up until midnight and stay the same night.